Fernie cadets celebrated 49 years of service this year at their annual cadet review. Dignitaries from across the province joined the cadets and staff of the #2757 cadet corps for the June 1 inspection, carried out by Lieutenant-Colonel Mason Stalker. “An annual cadet review is not just a culminating day, it’s a celebration of family,” said Stalker in a post-awards speech. Cadets showed off their marching and shooting skills during the review, as well as their knowledge of military practice via displays at the Fernie Cadet Hall. “I’m very proud of each cadet on parade today,” said Capt. Peaches Pennock, commanding officer of the 2757. Among the awards handed out, were the Royal Canadian Legion Medal of Excellence, going to Sgt. Alias Engelhardt, and the Lord Strathcona Medal, going to CWO Breanna Howard. On the importance of the cadet movement, Stalker said: “Everything that I needed to know to be a Lieutenant-Colonel in the Canadian Armed Forces, I learned while I was in cadets. 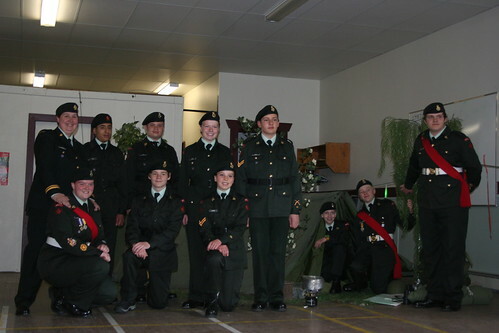 The cadet movement is probably the best kept secret in Canada, and that concerns me, because this secret is worth sharing.” Fernie hosts one of 44 army cadet corps in BC, supported by various organizations, including the Royal Canadian Legion and the Fernie Rotary Club.